Hours: M - F, 9A - 5P MST  573 2432 ©2018 Transportwrap. All Rights Reserved. a.1 - How easy is it to apply? a.2 - What if I mess up during application? a.3 - How easy is it to remove? TRANSPORTWRAP peels right off, cleanly and easily and does not damage the exterior of any cured, factory painted exterior finish as it is designed for this specific application. a.4 - What if I want to cover the whole vehicle? 1 roll of TRANSPORTWRAP (400sq. ft) is typically enough to cover and protect an entire vehicle in most cases. Vehicles vary in size and shape. For example, covering a full size truck with extended cab will require almost the entire roll. Keep in mind that most dealerships do not even cover the entire vehicle during transport. However, they are also confident that the new vehicles being hauled will not leak/drip fluids down on to the lower rack of cars. If you do cover the entire vehicle, make sure to trim for opening doors, necessary air intakes, driver visibility, etc. as most likely your vehicle is going to be driven on and off the carrier transport during its journey. b.1 - Is it okay to put it on my paint job (repainted vehicle)? Common practice within the automotive paint industry is to recommend that you do not use any chemicals, cleaners, waxes, polishes, etc. on any re-painted surfaces for 30-90 days and/or until it has fully cured. It would be best to contact your paint specialist to find out what they recommend for their product as they would be most knowledgeable about their own gassing out phases. Although our adhesive is water based and designed to not leave any residue or damage paint, you use at your own risk if your exterior finish is not fully cured. b.2 - Is there a special technique to applying the wrap? 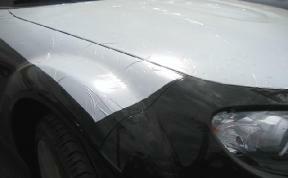 Always apply TRANSPORTWRAP to a clean and preferably washed/detailed surface to ensure the best adhesion. We recommend that you do not apply the product in heavy winds as dirt/dust could get trapped under the wrap. To prevent any edge of the wrap from potentially being lifted during high speeds it is recommended to begin wrapping the vehicle from what would be considered the rear when hauling and progress towards the front, layering over the previous layer. In the instance where the vehicle will be backed on to the carrier, you would want to start with the front and work towards the rear. This way all leading edges will benefit from being tucked under a layer of wrap that is more towards the direction the wind resistance will be originating from. We recommend that you inspect the wrap every 500 miles to ensure that it is still adhered properly and replace any sections as necessary. Using this menthod and when properly applied, TRANSPORTWRAP has been known to go 3859 miles! b.3 - Can it be used to protect other things (ex. boat, tractor, wagon, etc.)? Yes, you can apply the wrap to various surfaces. Solid, finished and smooth surfaces such as various plastics, polished or brushed metals, finished woods, etc. will all adhere to TRANSPORTWRAP. It will not adhere very well to fabrics, soft tops, flat/matte paint, heavily textured vinyl, or any other semi-porous surface. In addition to transport, our customers who are manufacturers use Transportwrap for protecting brand new cars during assembly (conventional and exotics), boats, firetrucks, tractors, custom vans, helicopters (ground transport and assembly), airplanes (assembly), airconditioning units, packaged pumping systems, miscellaneous panels and more. If you would like to know if TRANSPORTWRAP will work in your application please contact us. b.4 - Does it have an optimal "operating" temperature? Yes. Our tack strength is balanced for optimum performance for a variety of weather conditions around the globe. With that being said, certain temperature extremes will affect tack strength and require either extra preparation and/or consideration for application/removal. For best adherence performance, it is recommended that the roll itself as well as the surface temperature you are applying to be approximately between 50-90 degrees F (10-32 degrees C). Even the strongest adhesives have difficulty adhering when applied in the cold. Do not store the roll outside and/or try to apply it to a surface outdoors if you are in or near freezing temperatures. For best results keep the roll(s) and vehicle(s) indoors prior to application if possible so the surface won't be too hot or too cold. Please note that ambient temp and surface temp are two different things as a surface can still stay warm in direct sunlight for application even if the air is cold. If applied and removed within optimal temperature range and conditions, the wrap can endure the hot highways of Arizona during the summer as well as harsh winter roads in Alaska. c.1 - I see bits of residue left over after removal, what do I do? For optimal performance the wrap should be both applied and removed between 50-90 degrees. There have been instances where if it is removed in very cold temperatures or very hot temperatures the adhesive layer can separate from the protective film and experience some transfer. As a result some portions of adhesive stay on the automotive surface. If applied properly the material will stay on and protect outside of temperature spec but once the haul is complete it is advised that you either let Transportwrap warm up or cool down to within optimal temperature range prior to removal (for best performance) and again, same goes for applying it (for best stick). In instances where residue is left after removal usually a car wash or two will get it off or you can try dish soap with warm/hot water manually. In the rare instance that there is still some residue left over after this, customers have had great success using Lift Off No. #2 (made by Motsenbocker's for around $5) which can be bought at any hardware or cleaning supply store (Lowe's, Menard's, Home Depot, etc.). It has a low-VOC formula that will breakdown the molecular adhesive bond of any remaining adhesive safely and easily as it is certified biodegradeable and uses a water-based formula that is safe on painted surfaces. c.2 - I've heard that some carriers will not let you wrap your car, is this true? As much as it does not make sense to prohibit an individual from wanting to protect their own property, this is actually true in certain instances. For ex. the state of Hawaii will typically not allow cars to come in with this wrap applied (concerns raised range from it bringing in foreign elements from the mainland like certain bugs, seeds, pollens, plants, etc.). In other instances, there are a few carrier companies and/or individual drivers that either prefer or will not allow the wrap since they are concerned it could hide defects on the car that could potentially be fraudulently claimed later. Of course this does not protect you from the damage that could still occur during transport from debris and dripping chemicals which you usually have to sign a waiver for anyways. In this event, we simply recommend you contact the carrier/driver ahead of time and suggest you take detailed pictures of all sides of the vehicle prior to wrapping and provide those to the carrier, reiterating how important it is to you to protect your vehicle's exterior finish. 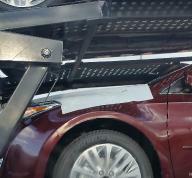 It is advised to confirm with your carrier that the vehicle can be covered with a protective wrap prior to ordering, especially if you may be riding on the bottom of the carrier. c.3 - Are there daily shipping cut-off times? All orders placed before 4:00pm MST ship out on the same day and will be received within 2-3 days (in some instances such as very rural/residential locations 4 days) and ship either FEDEX Ground, UPS Ground, or USPS Priority Mail. In order to be eligible for FEDEX Express Saver, Standard Overnight shipping, FEDEX First Overnight (delivery by 8am*) and FEDEX Priority Overnight (delivery by 10:30am*) (*to most locations) the order must be placed prior to 3:30pm MST to ensure that it will be worked and ship that day. When using FedEx, Saturday delivery must be specifically requested. c.4 - I left it on too long and it dried up and is hard to come off, what can I do? Our product is labeled either 30-day or 180-day. This is based upon our projections of the longevity and durability of the adhesive to retain its moisture in direct sunlight which will vary slightly by elevation and geographical location. If you either forgot to remove it or left it on past the recommended application time and depending upon several factors (elevation, indoor/outdoor, summer/winter, etc.) will effect how dried out the water-based adhesive has become leaving the material burdensome to remove. You cannot technically put the moisture back in to the water-based adhesive so it will not remove easily like it's intended to so here are some suggestions for removing it if you exceeded the prescribed limit: (1) Use dish soap, warm water, and a sponge. (2) A powerwasher spray. (3) Customers have had great success using Lift Off No. #2 (made by Motsenbocker's for around $5 available at any hardware or cleaning supply store –Lowe's, Menard's, Home Depot, etc. having a low-VOC formula that will breakdown the molecular adhesive bond of any remaining adhesive safely and easily as it is certified biodegradeable and uses a water-based formula that is safe on painted surfaces). Again, please save yourself this additional hassle and order accordingly and be mindful of applicaton time so as to not exceed the prescribed limit. c.5 - Can I use it to protect my headlights during transit? It depends. In some instances it can react with a car manufacturers' proprietary protective film/finish that they apply on their headlight lens covers (such as a UV protectant layer to prevent oxidation, a special film to prevent spider cracking, etc.). Due to the wide variety of manufacturers and their own R&D to try to keep headlights looking as bright, shiny and clear for as long as possible we unfortunately are unable to guarantee that our acrylic-based adhesive (water based) will not somehow interact with any manufacturers' proprietary film on your vehicle's headlight lens covers. However in the instance of a real glass headlight (typically on classic cars) without a lens cover or protective film, Transportwrap is safe to use on all glass (windshields, mirrors, etc.) so it can be used to protect headlights with a real glass front. If you are unsure of what material your headlight lens covers are made of (plastic, glass, acrylic, etc. ), or whether or not it has some sort of film applied to it from the manufacturer, we recommend to play it safe and not use Transportwrap on your lens covers. d.1 - Why do you ship USPS? This is mainly for residential and rural customers and/or PO Box addresses. In addition, for a majority of international orders, the US Post Office has the lowest rates available. There are also instances where USPS Priority Mail is able to deliver a package to its intended destination faster than FEDEX Ground. For each order we do our best internally to determine the best carrier and choose the fastest delivery method. Customers are welcome to inquire estimated delivery times for ground shipments as well as inform us of their carrier preference. d.2 - Why do you use Paypal? It's fast, easy, insured, and does not even require a Paypal account to use as it functions as a secure credit card transaction processor. Paypal also accommodates all of our international customers by providing instant exchange rates as we regularly ship overseas. Distributors and customers on net terms can choose to remit payment via company check. Thank you for taking the time to review our FAQ!